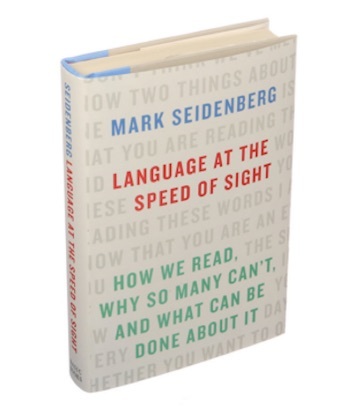 The latest episode of Brain Science (BS 136) is discussion of Language at the Speed of Sight: How We Read, Why So Many Can’t, and What Can Be Done About It by Mark Seidenberg . Unfortunately I was unable to reach the author, so this is a return the show's early days when it was not dominated by interviews. This book contains information that is important to anyone who cares about how children learn to read. One key theme is that there is a large gap between current reading science and educational practice. In this podcast we explore the relationship between spoken and written language, including a very important difference: spoken language evolved but writing is an invention: the original information technology. We revisit several of the topics that we originally explored back in BSP 24, but we also explore some new topics such as how written languages reflect the unique properties of their particular spoken languages. Ultimately, the most important question is how do people learn to read? The scientific perspective includes not only what has been learned about reading and the brain, but it also includes general principles of human learning. We consider the evidence that phonology is important, the role of statistical learning, and the physiological limits related to vision and cognition. Landauer, T.K., & Dumas, S.T. (1997). A Solution to Plato’s problem: The latent semantic analysis theory of acquisitions, induction, and representation of knowledge. Psychological Review, 104, 211-240. BSP 29 is an interview with Maryanne Wolf, author of Proust and the Squid. Brain Science is independently produced and relies on listener support. Click here to learn how you can support the show. Brain Science has a FREE mobile app, which is a great way to access both FREE and Premium content. This month you can access BSP 24 for FREE via the extra content feature of the app. Brain Science will be coming out the last Monday of the month through November.